In this series of short posts I'll touch on a few topics that you should think through when starting a company. I'll provide some examples of slides from pitch decks of successful companies that effectively communicate these topics. Defining the unmet need you are addressing is a critical initial step in assessing whether a product will be viable. Understanding unmet need is also very important to guide product development. It is generally not economical to fund drugs that don't address a large unmet need. If you are saving someone from dying, you are providing much more value than if you were developing a better-tasting cough syrup. Because drug development is so expensive and risky, if your drug does not provide a lot of clinical value, it won't be worth much to payers, patients and physicians. This is a big reason why most startups today focus on refractory cancer and severe rare disease. If your drug dramatically improves patients' health, you don't need a to treat a ton of patients to have a big product. So when you think about your market size, throw out everything you hear about TAM / SAM / SOM, and drill down into the specific unmet need of a specific group of patients you want to treat. Talking about markets in generalities, instead of focusing on patient needs, will probably get a VC to look at her phone instead of your deck. Unmet need is important, but you should be able to communicate the unmet need quickly, concisely and quantitatively. Most investors will very quickly grasp whether your unmet need is significant, so show them you've done your homework, then move on to explaining why your platform and products will address that unmet need better than anything else on the market. This slide is actually pretty depressing, but does a great job of communicating unmet need. Again, it is very specific and quantitative where possible. And the format is very concise and rich: there is a lot of valuable information per unit of visual space. 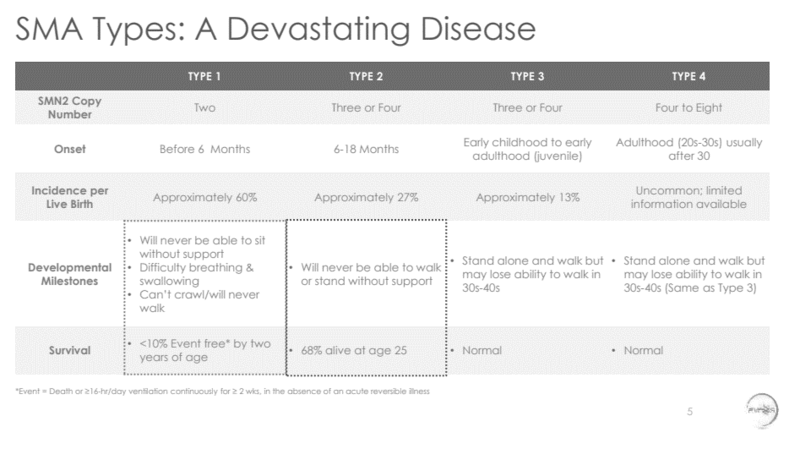 It is also a very vivid, yet precise and objective, description of the unmet need: all you see are facts, figures, and a footnote on the page, but as you read them you get an almost visceral sense of how terrible this disease is. This is another nice visual for describing the unmet need. 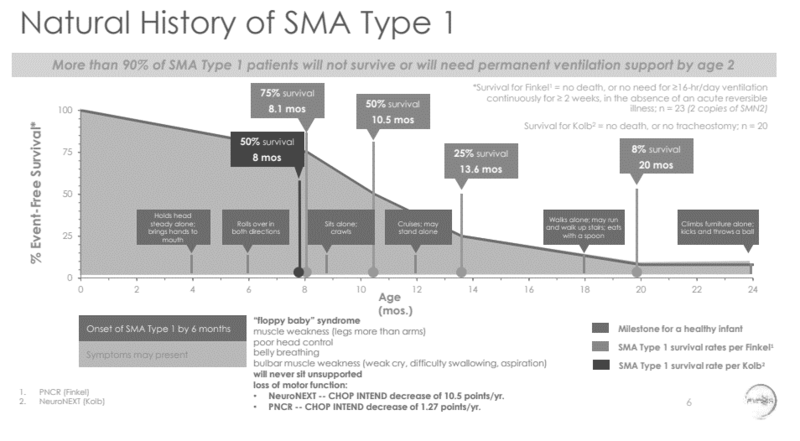 This shows survival data from two studies (presumably the two seminal studies in the field), and again, the survival data describe a terrible unmet need (I don't go into it here, but on a higher note, the drug actually does really great things for these babies -- you should read the full presentation if you're interested). Depending on your indication, you can use a variety of formats to describe the unmet need, but hopefully this gives you a sense of what you're trying to accomplish. This would also be a good section to discuss the standard of care, and the shortcomings of existing therapies in your target patient population. 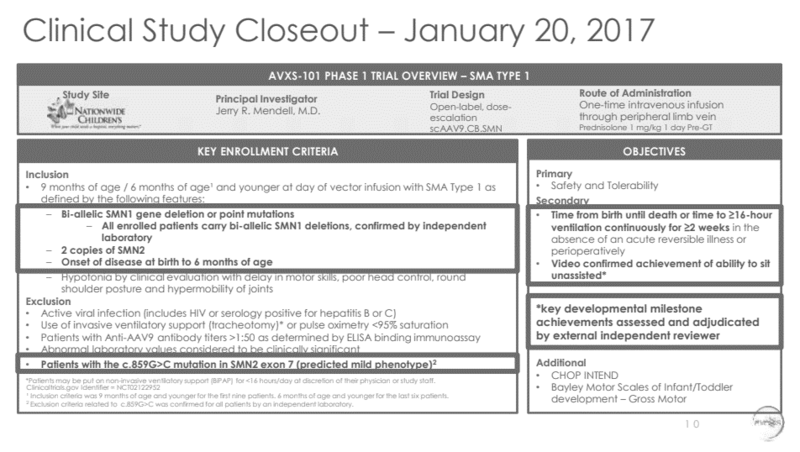 Because nothing really worked in SMA before AveXis drug (other than a Biogen / Ionis drug that I believe was still in development when this deck was made), I don't have any examples here, but you'll want to include some info on standard of care for your indication and where exactly your drug will fit in. Even if you are at a very early stage, you should give some thought to your clinical study design. The endpoints you study in your human trials should inform your translational work, and the design of the study should also inform your business planning. Phase 1, Phase 1/2 or Phase 2 studies that show your drug is working in humans often allow your company to get acquired or go public, so investors want to know that you can get to this point in a reasonable time (5ish years after their investment, ideally sooner). You may not need a full-time Chief Medical Officer if you are a discovery-stage company, but you should use your SAB, KOL interviews, and potentially clinical consultants who have designed and run clinical studies before to help you think through study design. Even at early stages, it's important to understand your clinical plan, as that's the goal you are working towards, and your translational and development plan will be informed by the clinical work you ultimately want to do (and vice versa). At an early stage you don't need to have a full detailed protocol, but should at least have the skeleton of a study design including some key points. You want investors to get a sense for 1) how long will the study take, 2) how much will it cost, 3) how much will they learn about whether your product works, and how confident they can be that the results of this study will predict the results of subsequent clinical studies. Read part two, Pipeline & products, here.